We just spent a weekend in Squamish, BC which is just a couple of hours north of home for us. 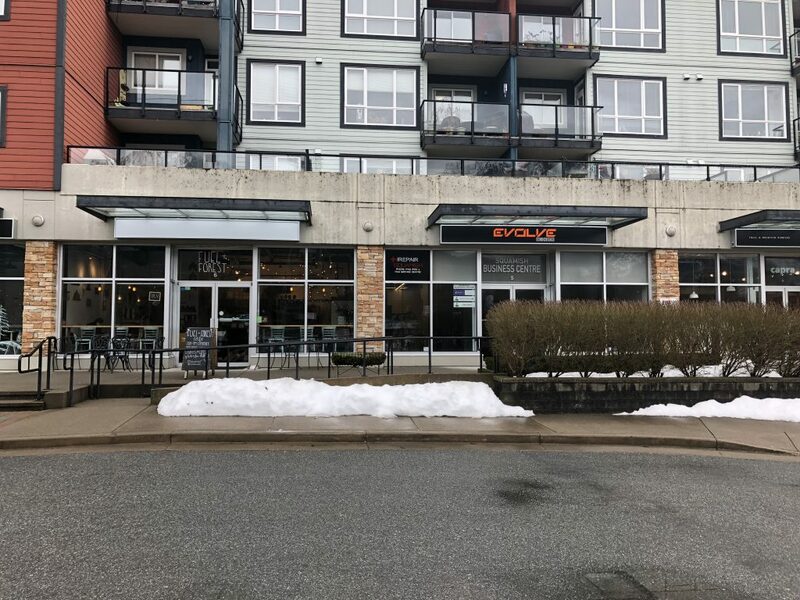 It’s sort of halfway between Vancouver and Whistler and this picturesque town of 20,000 is turning out to be a near perfect vacation spot for a couple of middle-aged vegetarian snowshoers. (I wonder if this is a demographic they’re targeting?) Once again, the Happy Cow website/app was a valuable tool to track down restaurants that would fuel our snow trekking adventures with plant foods. 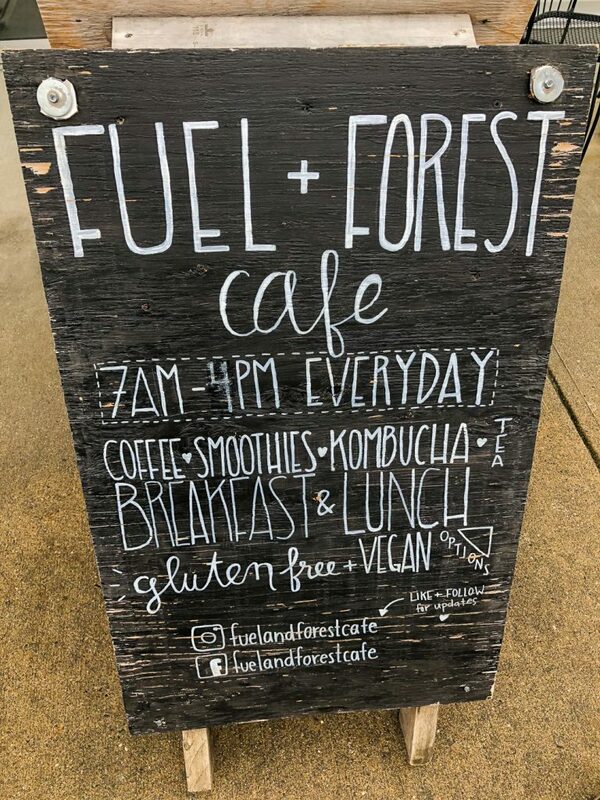 We actually ended up having a boatload of great meatless meals in Squamish, which I’ll be sure to blog about in the coming weeks, but the first one that deserves mentioning is Fuel + Forest. 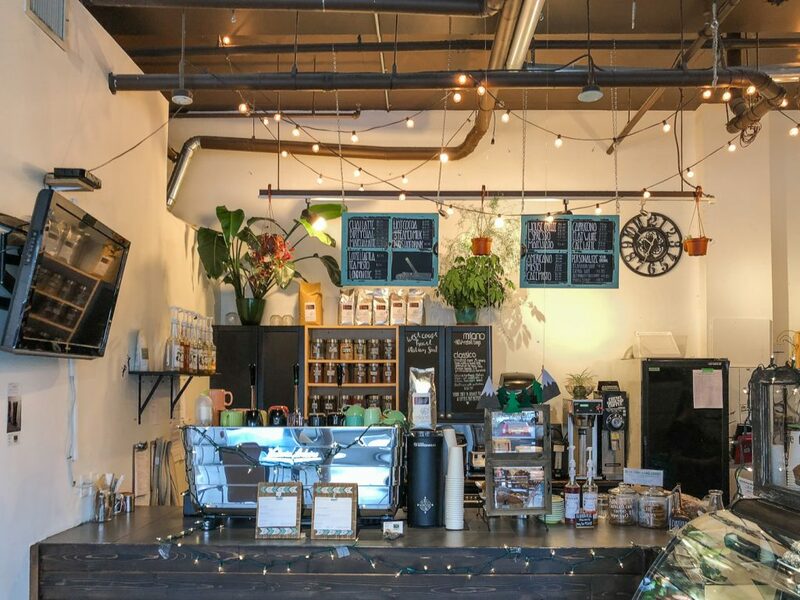 Fuel + Forest is a relaxed, comfortable, and cute vegetarian coffee shop. 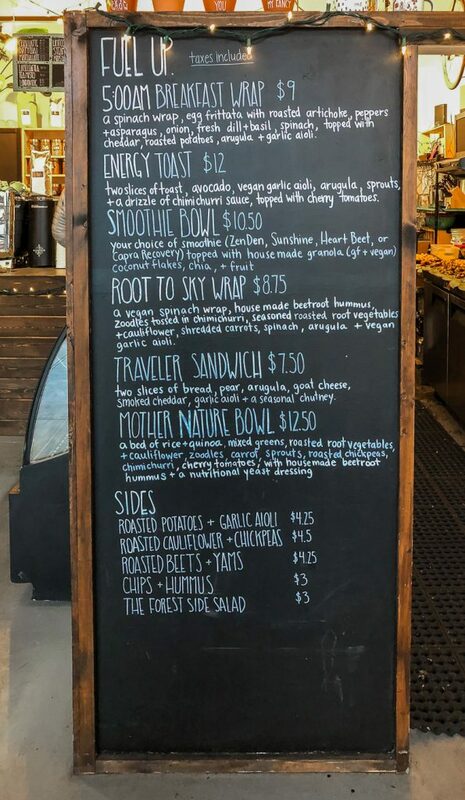 Their menu is small but well-rounded and I could definitely see myself becoming a regular customer if I lived nearby. We were so content with our Saturday morning meal we returned on Sunday. Here’s a run-down of the best (and the second best) they had to offer. I started with the HeartBeet Smoothie Bowl, which was pleasing to the eye and mighty tasty. Beetroot, ginger, turmeric, banana, cherry, strawberry, raspberry, and orange juice smoothie topped with chia seeds, banana, coconut, and granola. 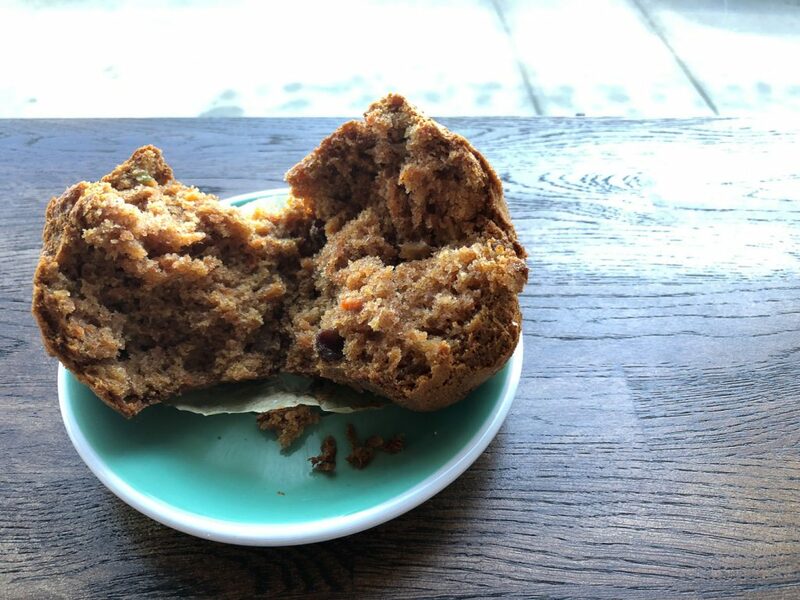 The combination of fruit and veggies was refreshing with a satisfying bite of ginger that mellowed as I continued to spoon it into my face, while the cherry predominated. The granola was the star of the dish, though, with its roasty flavor and extra crunchy texture and the banana sliced on top was perfectly ripe. 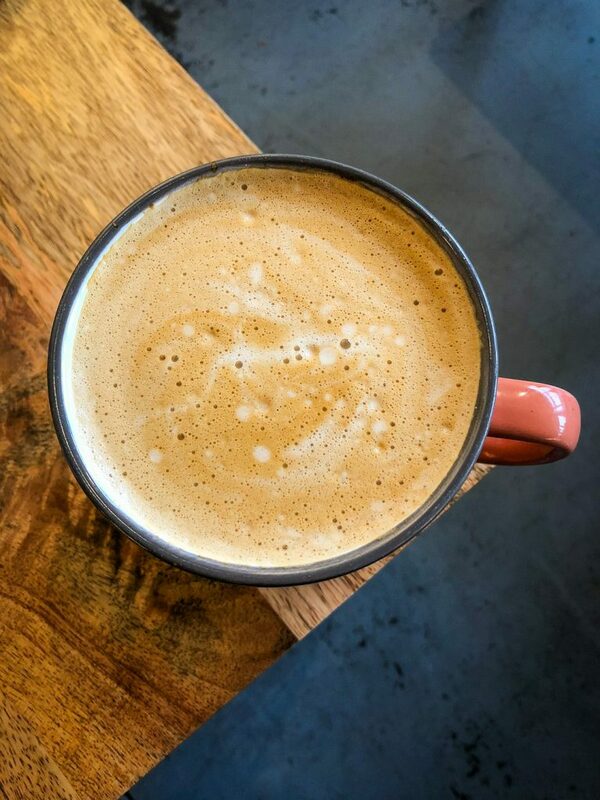 To pair with my smoothie bowl, I ordered a flat white with soy milk, which was somehow extra soothing to sip on a lazy weekend morning. Jeff got the Energy Toast. He said it was really good, with chewy bread and a nice crunch from the sprouts. As expected, the arugula was pleasingly peppery but the additions of chimichurri (a sauce typically made with parsley, oregano, garlic, and vinegar that Jeff described as “bright and fruity”) and garlic aoli brought everything together. I must say, I like to see so much green on a breakfast plate! 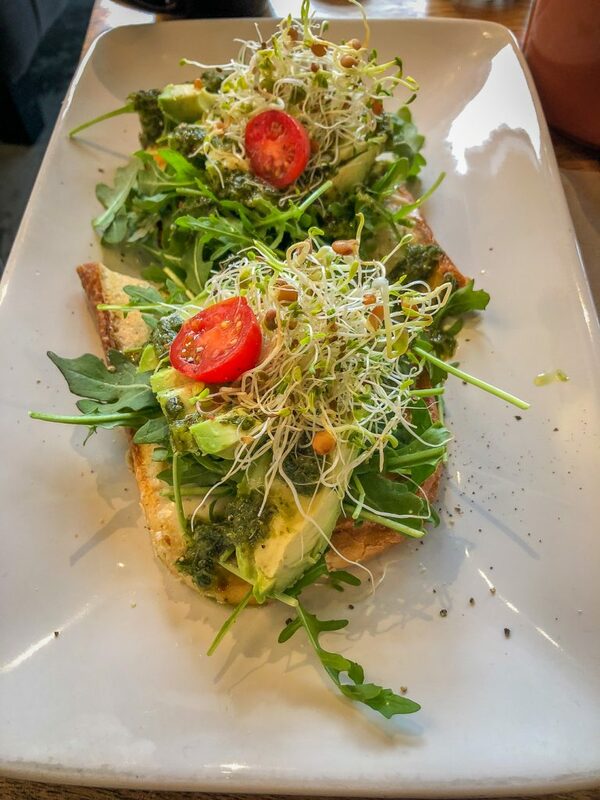 Two slices of toast, avocado, vegan garlic aioli, arugula, sprouts, chimichurri sauce, and cherry tomatoes. As an impulse buy, I also got one of their Chocolate Peanut Butter Energy Balls which were expertly stacked in the display case. 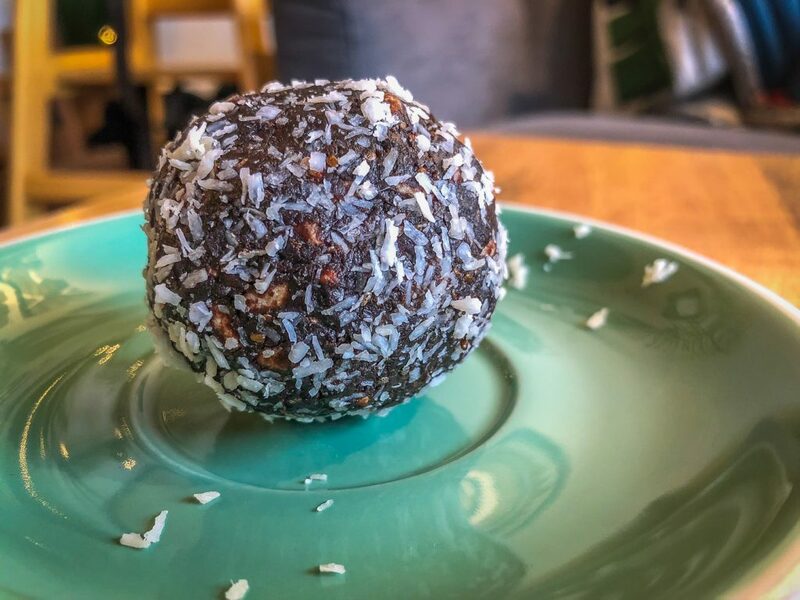 I think I could identify crisped rice cereal and dates inside, but the chocolate and peanut butter flavors were too mellow to boost the overall flavor, so I’m sorry to say it was kind of boring. Instead of trying somewhere new, we both agreed to return to Fuel + Forest the next day. With high hopes of exploring the menu more extensively, we ended up with awfully familiar foods. Jeff got the HeartBeet Smoothie Bowl and I branched way out of my comfort zone…and got another flavor of smoothie bowl: the Capra Recovery. Despite exclaiming, “chocolate chips!” out loud, in front of the server when she set my bowl down in front of me, my excitement was tempered somewhat as I tasted the smoothie. The cocoa flavor was very mild, and it seemed to be missing the spark that HeartBeet had. Maybe it needed some acid or simply more cinnamon to pump things up? 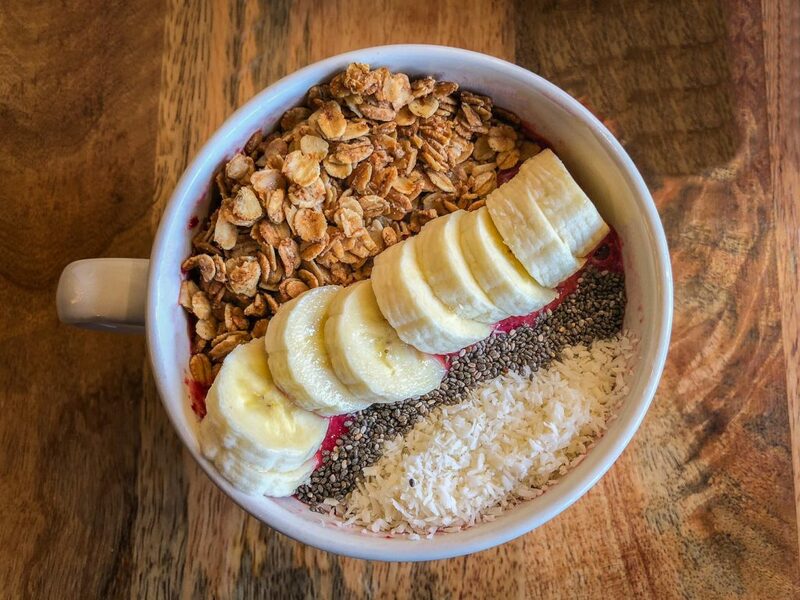 (I saw that you could get a shot of espresso added to the smoothie bowls. Often bakers will add espresso powder or coffee to chocolate desserts to emphasize the chocolaty-ness. They may have been just the ticket with this particular smoothie flavor. Next time!) Having said that, the somewhat humdrum backdrop made the toppings really shine. 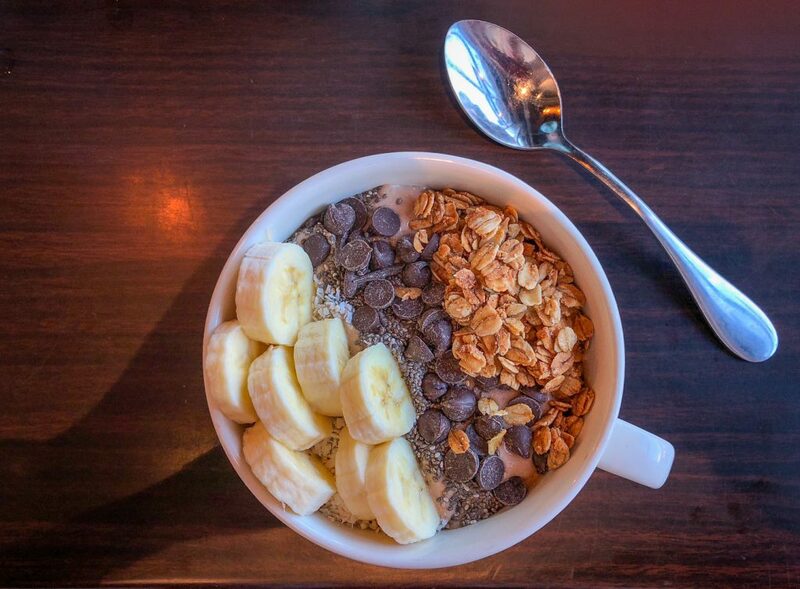 The chocolate chips, chia seeds, coconut, and banana were definitely the star of the show (star of the bowl?). Banana, oats, peanut butter, cocoa, avocado, cinnamon, and coconut milk smoothie topped with banana, chia seeds, chocolate chips, and granola. After two blissful mornings spent lounging in their comfy chairs and eating myself silly, my only complaint would be that Fuel + Forest is a little hard to find; at least it was for us. They’re tucked on the backside of a strip of businesses so you have to know they’re back there because you won’t notice them just driving by. Also, their signage needs to be bigger and bolder to get the customer’s attention. Right now they kind of fade into the background. On the plus side, we stayed at the Executive Suites Hotel and Resort so Fuel + Forest was just half a mile down the road. I’m so pleased when I find restaurants that are trying to do it right. Instead of the standard American breakfast of bacon and eggs Fuel + Forest is branching out and envisioning a morning meal of fruit, whole grains, vegetables, nuts, and seeds…which by the way is exactly the way we’re supposed to be eating for minimizing disease risk and maximizing health. 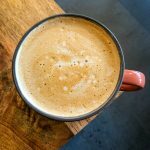 Choosing to serve healthy ingredients is one thing, but making them appealing enough to bring us back for an immediate second visit is another thing entirely. I’m not sure when we’ll return to Squamish, but Fuel + Forest is definitely a keeper, and I hope to be back soon and repeatedly for visits #3 through 98. Sounds like you and Jeff had a great weekend together! Happy to hear this! Baked goods okay to transport, as long as they don’t contain meat (not an issue for you! ).